The transformation of Desiderio's city into a mysterious kingdom is instantaneous: Hallucination flows with magical speed in every brain; avenues and plazas are suddenly as fertile as fairy-book forests. And the evil comes, too, as imaginary massacres fill the streets with blood, the dead return to question the living, and profound anxiety drives hundreds to suicide. 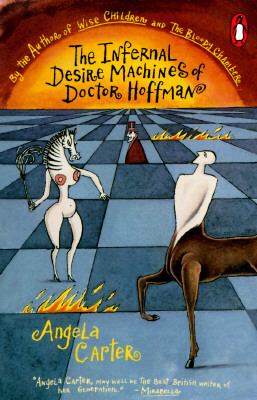 Behind it all stands Doctor Hoffman, whose gigantic generators crack the immutable surfaces of time and space and plunge civilization into a world without the chains – or structures – of reason. Only Desiderio, immune to mirages and fantasy, can defeat him. But Desiderio's battle will take him to the very brink of undeniable, irresistible desire. "Angela Carter may well be the best British writer of her generation." "Combines exquisite craft win an apparently boundless reach."